Joss Whedon's web musical/comedy/slice of genius 'Dr Horrible's sing-along blog' has become an enormous hit on both sides of the Atlantic, and could prompt even greater investment in web-first television. Starring Neil Patrick Harris (of Doogie Howser fame) and Whedon stalwart Nathan Fillion, Dr Horrible is the story of an evil genius whose main goals in life are to rule the world, defeat his nemesis Captain Hammer and get the girl from his laundromat. Unfortunately, in the first two episodes, we learn that the Doctor is a bit of a flop in the evil stakes, and that his rival is quite the arrogant cad. Whedon's decision to use musical interludes in the story sounds particularly strange – although he has managed to produce a musical episode of perhaps his most famous television show Buffy the Vampire Slayer. And incredibly it works brilliantly – from the sublime sung messages from Bad Horse – the leader of the Evil League – to the pompous posturing of Captain Hammer. "It's the story of a low-rent super-villain, the hero who keeps beating him up, and the cute girl from the laundromat he's too shy to talk to." says Whedon. Whedon – whose next television project Dolls House airs in the US later this year and who wrote Pixar hit Toy Story – is not the first television man to move onto the web – but it is a project that has caught the mood. It seems only a matter of time until UK television stations begin to focus on webisodes of their own major franchises. 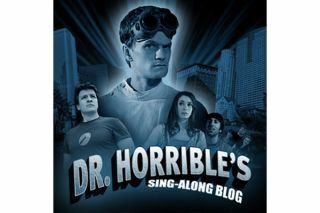 You can watch Dr Horrible episodes on http://doctorhorrible.net/ with the third part available on Sunday 19th July.